24 A, Angel Kantchev str. Join us at the Art-Hostel for the unique experience that we create, now for almost 15 years, offering art events to travellers from all over the world and meeting local artists with travelling people. We are people who like to mingle with others, so if you like to share your beer with locals, then we're the right place for you. 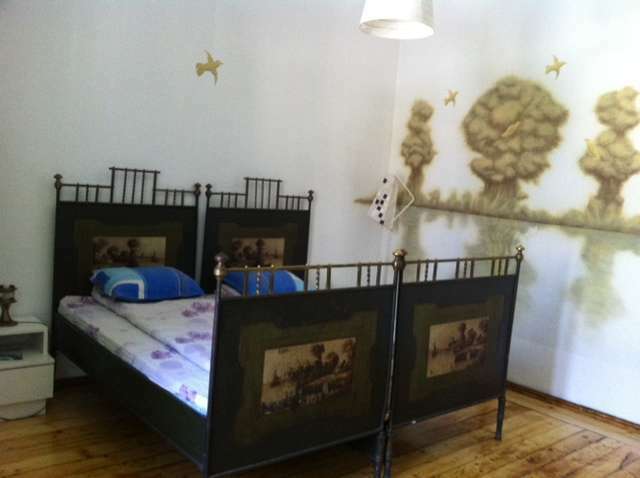 The Art-Hostel is situated in the very heart of the city offering access to main attractions and offers artistically decorated dorms and private rooms, all with breakfast; social bar-gallery space for music, literature, video, theater, performance events and the best hidden green inner yard you can find in Sofia. Wi-Fi everywhere. What the “Guardian" says for us is: “Explore and enjoy a Parisian mentality and a Russian thirst for liquor in the centre of Sofia. 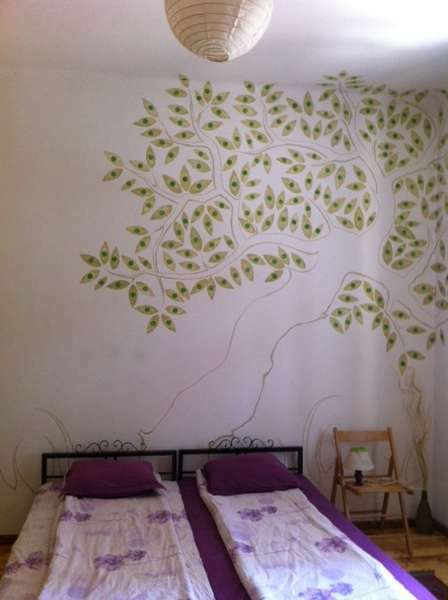 Probably the best hostel in Europe"
Guest will have access to the best green inner yard in the city, to meeting lots of cool locals, to concerts, exhibitions, events, presenting Bulgarian culture. 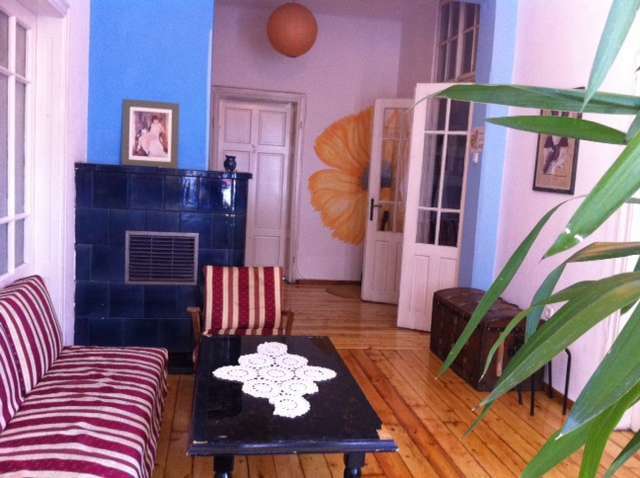 As well as fully equipped kitchen, bar-gallery, chill-our area with computers and free WiFi. The best place for interaction between trаvelers and local people. Our receptionists are normally young people involved in different arts fields and speak several languages, so ask them anything! There are buses, metro and trams within minutes walk from the hostel. There are two paid secured parking spaces on the corner of the hostel-2 BGN per hour. We truly are the most centrally located hostel in Sofia, only minutes' walk in any direction to the National Theater, National Art Gallery and independent galleries, National Palace of Culture, Alexander Nevski church, Sofia University, book market, food markets and antiques market, main post and phone palace, Sofia city garden, banks and ATMs, cafes, cinemas, restaurants, clubs and much, much more. bus 84, 284 get off on the last stop on Vassil Levski blvd., go up Vassil Levski blvd. opposite Sofia University, take any trolley bus for 2 stops, or walk - the 8th street on the right is Angel Kanchev.
. metro for 3 stops to NDK metro station, then walk back Vitosha str. and turn the fourth street - Gladston on the right. The second little street you reach is our street. tram 12 for 5 stops, get off on Garibaldi sq. and walk down Angel Kanchev str. Be aware of taxi frauds! The only authorized taxi from the airport and Central Bus/Train Station is yellow taxi OK Super trans, 973 2121. Approximate day tariff 0.79 stotinki per km, night tariff 0.90 stotinki per km. Cancelation at least 48 hpurs before departure. Otherwise full charge of the amount to be paid will be charged. Groups must advise cancellation at least 2 weeks in advance, otherwise no deposit will be refunded.